In this practical guide, Emmy Award-winning public broadcasting anchor Steve Adubato teaches readers to be self-aware, empathetic, and more effective leaders at work and at home. His powerful case studies spotlighting dozens of leaders—from Pope Francis to New Jersey governor Chris Christie—are complemented by concrete tips and tools based in real-life scenarios. With Lessons in Leadership, readers can learn to steer others through difficult economic times, to mentor rising leaders, to provide straight talk to underperforming employees, and even how to lead a company through a significant change. 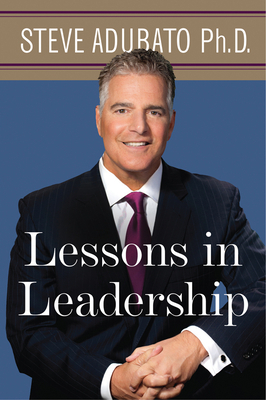 STEVE ADUBATO, Ph.D., is a prolific writer. His books include What Were They Thinking?, Make the Connection, and You Are the Brand (all Rutgers University Press). He is an Emmy–Award winning anchor for PBS affiliates Thirteen/WNET and NJTV, who has served as a distinguished visiting professor at New York University, Rutgers University, Seton Hall University and the New Jersey Institute of Technology. Adubato has appeared as a political and media analyst on CNN, NBC’s Today Show, Fox News, NPR, and AM970. His company, Stand & Deliver, offers leadership workshops and executive coaching for professionals in a variety of arenas. "A blueprint for the wise use of power." "Public speaking is always one of the best things I hate. But Steve always tells it right; he can make any talk easier than it sounds."